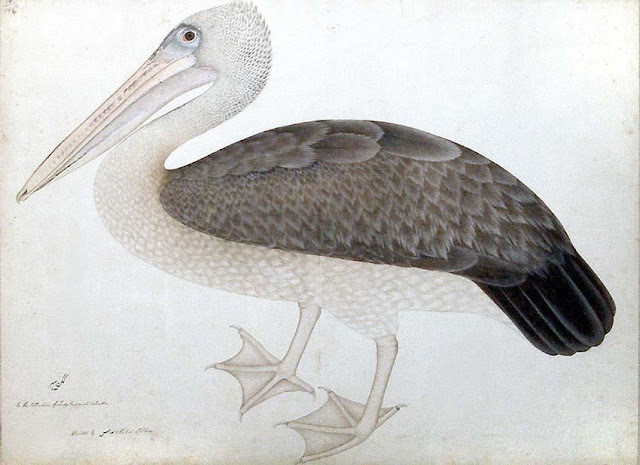 Graham Arader: Painting of the Day: Ram Das: "Spotbilled Pelican"
Painting of the Day: Ram Das: "Spotbilled Pelican"
Dimensions: 21" x 28 1/2"
During the years that Sir Elijah Impey (1732-1809) and his wife Mary spent in India, they commissioned a unique and highly important collection of original Indian artwork. In 1774, Sir Elijah was appointed the first Chief Justice in Bengal, as a result of the new Regulating Act which required the establishment of law courts in Calcutta. While he set about collecting Indian and Persian manuscripts and miniatures, his wife Mary, bound to the home by family duties and frequent childbirth, established a menagerie in the grounds of their Calcutta house. Recognizing a profound level of talent in several Indian artists, she employed at least three to paint the striking, exotic flora and fauna in her garden. Foremost among these artists were Shaikh Zayn-al-Din (fl. 1777-1782) and Ram Das (fl. 1777-1782). Both artists were trained in the Mughal tradition of the Persian court painters, and their work demonstrates outstanding talent for capturing detail and color. The Muslim artist, Shaikh Zayn-al-Din, was one of the first to work for Mary Impey, his employment beginning in 1777. He, like the Hindu, Ram Das, was a native of Patna and it is likely they migrated to Calcutta in search of work as traditional Mughal patronage weakened under British Imperial rule. As can be seen in the works shown here, both artists favored showing their ornithological subject matter in profile and each watercolor displays an outstanding attention to detail. The birds are portrayed with such naturalism that they appear alive. Every feather is in perfect focus and the textures of the birds beaks and feet contrast with the smoothness of their plummage. Each emerges with surreal clarity from the blank background, and regards the viewer with an unblinking stare. Such exquisite detail is extremely difficult to capture in the medium of watercolor, and Shaikh Zayn-al-Din and Ram Das masterfully combine precision with simple, vibrant colors in order to create images that exhibit a great level of personality. An unprecedented style emerged with the work for the Impey collection and the project produced magnificent results. Previously no Mughal artist would ever have placed a bird detached from a landscape setting on a white background, while no European artist would ever have bestowed on his subjects, such character and animation. Ram Das and Shaikh Zayn-al-Din approached ornithological illustration from an unconventional standpoint. They abandoned the practice of using stuffed specimens as a basis for their study, and instead injected a ground-breaking vitality into their birds. Their work is considered to be of fundamental importance to the development of European natural history painting, both artistically and scientifically. Sir Elijah Impey and his wife Mary were the first European patrons of Indian natural history painting, and are still considered to be the most important. These exceptionally rare watercolors come from a group that the Impeys brought back to England in 1783. Today, other watercolors from their collection can be found in the Victoria and Albert Museum, the Radcliffe Science Library in Oxford, and the Binney Collection at the San Diego Museum of Art, while a very small number remain in private collections. Arader Galleries intends to have the lowest prices on ABE, Alibris, Biblio, AE, and Artnet while maintaining the highest levels of quality in the business for every offering. To inquire or view the complete offering, please contact our curators at info@aradernyc.com or call our 72nd Street NYC gallery at (212) 628-3668.